Tomahawk Studios’ Saga has captured my imagination and attention lately. Last summer I finished a six-point Anglo-Dane warband before we moved to a new state in hopes of finding gaming partners through the popular system. I recently connected with a few other new players. When Age of the Wolf (AotW) released, we bought up a copy as quick as possible. While we have had a great time playing one-off Saga games, AotW‘s campaign system adds a whole new layer of enjoyment. Now my Anglo-Danes have names and histories! Their heroic deeds and unfortunate failures echo from game to game, and my collection is starting to grow again. With our first campaign season complete, it is time to deliver a short review of AotW. AotW‘s system is highly abstract and asynchronous. There are no meta-maps to track, no wonky points values to move around, and no need to have every player in the room at once. While campaigning on a big map where territories grow and shrink is a lot of fun, my experience is that complex campaigns peter out quickly. I have very little time available for my hobby these days, so I appreciate the flexibility of AotW. Armies don’t march across maps in AotW, but the campaign adds some extra meaning to game outcomes, a little character to your warband, and a lot of motivation to keep building and playing. The system’s flexibility is also a major asset. Players can easily jump in to the campaign, drop out, or temporarily withdraw without disrupting play. In short, the campaign plays out over six “seasons.” In each season, each player chooses one action (raid, campaign, defend) and one target. Everybody’s actions are compared together on a simple chart that generates the types of games to be played in the season. The whole process takes just a couple minutes. Players are then free to schedule their own games at their convenience within the realtime limits agreed to by the group. Can’t play a game this month? No worries…just pay the Danegeld in money or land and move on to the next season. The campaign is built around the saga of your warlord. A few die rolls at the beginning of the campaign generate unique skills and traits for your warlord that turn him into something akin to a “Hero of the Viking Age” character. For instance, Tostig Bloodeaxe (my Anglo-Dane warlord) his favored by the gods (and so may roll twice on the post-battle fate table and choose his preferred result) and has a blood feud with another player’s Viking warlord. Tostig also has a “Conqueror” ability that adds attacks to units within M distance if Tostig himself is not in combat. Your warlord’s warband will grow and shrink each season depending upon casualties taken in combat and the result of fate rolls between games. Campaign scores are based on your warlord’s accumulation of land, wealth, reputation, and campaign victory points. The first three are usually earned as a result of successful campaigns, raids, and defenses respectively, though there are other options too. For instance, Tostig can gain reputation and wealth if he slays his blood feud target in combat. Pursuit of these various types of points adds depth to individual games. Take our last game for example: though my warband won (leaving behind several burning Norman supply wagons), my opponent actually walked away with bigger gains in reputation and wealth because he fulfilled his blood feud by wounding my warlord. I won’t go in to all the details of campaign mechanics here. If you want more of those details, you can check out an extended run-down at the Harold’s Revenge blog. Warbands start at four points, and the composition is limited by the amount of land (levy), wealth (warriors), and reputation (hearthguard) that you warlord collects. Ordinarily, warlords start with two of each (land/wealth/rep), so may select up to two of each type of unit. Players receive limited reinforcements at the beginning of each campaign season. After games, warbands lose figures as permanent casualties at a rate of one for every four models removed during the game. In the post-game phase, some fate roll results deliver reinforcements or unit upgrades. I am still confused about how “units” in the campaign tracker and “units” in the game relate. Can players balance their units in games for optimal dice generation or pursuit of mission objectives, as in a normal game? If so, how does one track which campaign “unit” took casualties? I need to do more reading. For now, we’re letting players reorganize their warbands in game. We then track how many of each type of unit (levy/warrior/hearthguard) took casualties and let the player decide which campaign units lose models permanently. Rogbert the Handsome and his warrior meat-shields go in for the kill against Tostig Bloodeaxe, the Anglo-Dane warlord and unlucky target of a Rogbert’s blood feud. So, after our first season, would I recommend purchasing AotW? YES! The system is straightforward and simple to manage. Although built for the 1066-set, it could easily be translated for Crescent & the Cross. Plus the price is right at less than $20. In all, we have already gotten a fantastic return on investment in this supplement. The crucial moment. Tostig desperately fights for his life at the top (he escaped with a flesh wound) while the elite Norman knights confidently ride in for the kill in the center…a little too closely to some Anglo-Dane warriors. The subsequent Lords of Battle assault devastated and exhausted the knights. Quick update as I inch closer to finishing a squad of late-war German grenadiers for Chain of Command. Here’s my latest 10-man squad. Just a platoon leader, extra senior leader, LMG team, and panzershreck team to go…then on to some supports! LMG team above is from Black Tree Designs. I was surprised by how few companies manufacture German LMGs in the prone firing position. BTD’s are nice, except that they have some distinctly mid-war touches, such as the high boots. The third crewman is from Warlord’s veteran grenadier plastics set. Some glorious old Bolt Action Miniatures (BAM) figures I found in my basement, courtesy of an abandoned project from a decade ago. Lovely figures–buy some up if you ever see them on sale. On a related note, I played the second scenario of the 29, Let’s Go! pint sized campaign today. Two lessons learned as the Germans: first, playing within a campaign structure adds so much to the game–many more decisions! Second, I’ve played too much to the Americans’ strength by trying to set up kill boxes at extended ranges. Those Shermans (along with marching fire) punished me. Next time the goal is to set up a deep defense, grab the Americans by the belt buckle, and give them a bit of the old MG-42. Most wargamers hit a rough spot once in a while. I make this generalization based on regularly encountering articles like my own (including an excellent piece in the recent WSS 87), most of which list a similar set of problems: lack of interest, lack of time, time spent reading and thinking instead of doing, and lack of partners. Last month, I could have checked nearly every box on that list. In the past week, however, my enthusiasm for this toy soldier hobby of ours returned full force! The motivational drags had been many, I think. Work and family demands cut into my hobby time, so I made very little progress on projects. I found myself thinking about and planning new projects despite having very little hope of ever bringing them to fruition. On the gaming partner front, I’ve met several others since moving this summer, but none of their interests match up well with my own, so joint projects are unlikely. Nobody else seems interested in planning activities either, which puts all of the administrative burdens and disappointments in my hands. After several recent last-minute game cancellations, I even found myself flirting with returning to GW’s warm embrace. Though 40k didn’t seize my interest, it at least seemed to offer easy access to gaming. The demotivation trend reversed this past week, though. I think the explanation is multi-causal. For one, the semester ended, and with it grading and lesson planning requirements, and my family went to visit the grandparents–meaning my available hobby time exploded. Instead of five-minute snippets spent blog trolling and day dreaming, I suddenly had hours for painting. Also, I met a few new gamers in the area whose interests more closely align with mine…and all it took was a TMP post. The meeting led to a game of Saga. I built a warband for Saga a while back, though I have not located the Saga gaming community I anticipated finding in my new area. The Saga game was good fun and the others expressed interest in playing again. Miraculously, Gripping Beast announced their new Aetius & Arthur expansion a week later, which activated a long-repressed hobby impulse. Finally, the last bit of motivation I need to get that Romano-British collection moving! While important, these external changes were not the most critical. Instead, I credit an internal mindset adjustment. A short meditation based on a passage in Thich Nhat Hanh’s How to Walk book triggered this adjustment. In the passage that struck me, Hanh observed that many of us spend our days running toward things in the future, but that we would be happier if we just walked through the present. I realized that I needed to change how I approached the hobby. In constantly dreaming up intense new projects, I was just creating task lists that felt like work, and I never realized any of those projects. I was also so obsessed with planning future projects that I stopped taking little steps toward achieving them, preferring instead to perfect a master plan before going forward. Take my 15mm WWII Ardennes project for instance. That one has been on the agenda for about three years now, but I haven’t got beyond buying a few figures because I haven’t settled on the ur-ruleset, universal basing system, and the perfect complement of table terrain. My big mindset adjustment has been to slow down and enjoy what I am doing right now in the hobby. I don’t need the perfect plan. I just need to focus on one or two things and gradually feel my way through them. First step? Order a pack of Battlefront’s rural roads so that I can experiment with making them appropriately snowy. One step at a time! My key lesson coming out of this experience is that I need to enjoy the process, and not just the end product. If I totaled up all my time spent on the wargaming hobby, actual gaming would make up only a small fraction of it. So instead of plotting that incredible mega-game that I’ll never quite finish (and much less play, given the constant need to introduce curious conscripts to my preferred systems), instead I can follow my whimsy and build/paint what catches my interest for as long as it catches my interest. I have enough work to do at the office. Who wants to come home to checklists and impossible deadlines in an activity that is supposed to be fun? Not me! Thus this year’s top goal is to keep things simple and follow my energy, wherever it goes. Now it is your turn, dear readers. Have you experienced a downturn in hobby mojo? Did you recover? If so, how? What tips can you share? How do you think we can best approach our hobby to maximize our joy? A while back I was seized by the urge to build up some Civil War forces for epic tabletop clashes. Big blocks of black powder troops called out to me as a wargamer in a primal way. But while I love the spectacle, the painting load is way beyond me. So, for the first time in my life as a wargamer, I put some figures out for commission painting. Some web searches and TMP scrolling turned up several solid options, from which I selected Fernando Enterprises. Below is a review of my experiences. Bottom line: I will use them for my future commissions! Fernando Enterprises is a commission painting group out of Sri Lanka. According to their website, they have been in the business since 1994 and employ upwards of 75 painters. I can’t verify any of that, but I have seen some of their work posted on TMP over time and read good reviews. 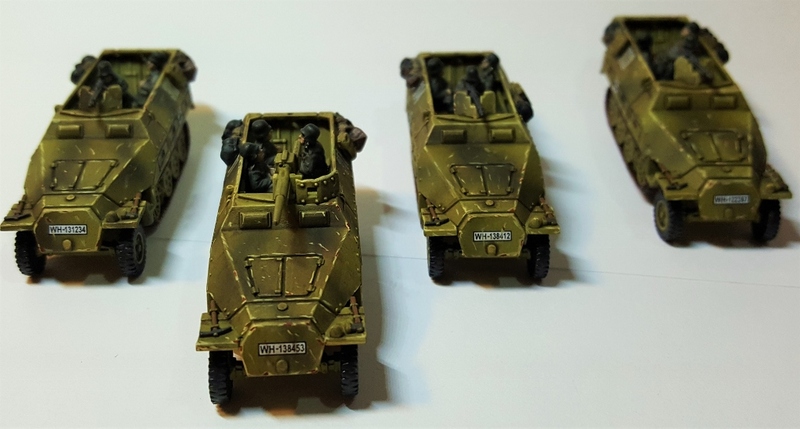 Fernando Enterprises provides a range of services including painting (posted examples include every scale from 6mm to 80mm), assembly, basing, and more. They provide three levels of painting quality in most scales: showcase, collector, and wargamer. My commission was all at the collector level, and I’ll discuss my impressions later. The price here is about as low as you can find, and certainly lower than you can find in the USA. As might be expected, the costs break down for foot troops, cavalry, and cannon primarily, but FE recognizes several additional categories too, such as camo/highlander. FE’s website includes a nice painting cost breakdown here. For my 15mm ACW “collector” level troops, the price came out to $1 a figure. FE is currently offering a discount of 10% on orders over $300 — get your order in before 31 December 2016 to take advantage of the offer. Keep in mind that you will need to factor in the postage cost to get your models to Sri Lanka. That’s a little steep, but the size of my commission still made this by far the cheapest option I found. I was not charged any extra for the return postage. In my experience, FE’s customer service was superb. They responded quickly and accurately to my request for a quote. They provided thorough instructions for mailing the unpainted figures to them (even if they could use another English translator to improve the clarity of the instructions). FE notified me upon receipt, then sent me updates every week or so once the models hit a painter’s table. In these updates, FE included pictures of example models and asked for feedback in case I wanted to make any changes. I was happy with what I saw, so I did not request changes, but I got the impression that FE would have been responsive. Not bad! Postage took about a week on either side. FE painted my full commission of over 300 figures in about two months. I was happy since I was not on a schedule of any kind. I’m not sure how much longer a commission would take if painted to a higher quality. I was impressed overall with FE’s painting quality. They were not up to the quality of figures I paint myself, but frankly they were of a quality I wish I could paint so that I could finish large projects fast. The figures are not individually worthy of museum display…but as a group, and especially from wargaming distance, they look great! I asked for FE to make my Confederates look like a motley collection with an emphasis on gray and brown colors to tie them together. FE used a lot of colors I would not have thought to apply, but I like the end result. My only regret was that I was not more specific about officer uniforms. The officers I received are wearing a lot of different, a-historical colors…but I can live with it. From a distance, nobody will notice. If you want something specific, consider sending an example figure, or at least some pictures. I will send some more detailed images with my next commission. Be specific with your requests–FE is responsive! Bottom Line: Great service, good product, price is hard to beat. I will use Fernando Enterprises again, and I recommend it strongly. Quick Note on the Project: This is part of my ongoing build-up for Black Powder (ACW variant). I’m aiming to commission the bulk of a division for both Confederates and the Union, then fill in interesting or scenario-mandated units myself. As a bonus, Dan Brown’s new Pickett’s Charge rules were just released, and my basing will work well for it. I’ve read through the rules and they look fun — can’t wait to give them a shot! This new job of mine has put a serious dent in my hobby time. Toy soldiers are rolling off the assembly line at a record slow pace. On the other hand, I have met several fantastic gamers. One of them is now hooked on Chain of Command, but he is especially interested in playing in 28mm, whereas I usually play in 15mm. His preference was more than enough to tip me into indulging a long-time interest in 28mm WWII…how could I resist? Here’s the beginning of my basic grenadier platoon intended for Normandy, Holland, and beyond (1947, anyone?). All the models are plastic and from Warlord Games’ Veteran Grenadiers box set. I really enjoyed assembling and painting these figures. They have a lot of character, paint up well, and provide a lot of room for customization. The set has only three drawbacks in my opinion. First, I don’t like how the zeltbahn ponchos are rolled at the shoulder. I understand why the sculptor did this (it provides for maximum interchangeability between arm options), but it looks a little goofy. Second, some of the arm options make for somewhat silly poses…not bad, but not great either. The complete arm-hand-weapon sculpts have their upside though, namely in ease of assembly. Finally, the pack contains far too few Kar 98k’s. Many of my boys are running around with Gewehr 43’s. I don’t mind too much because you can’t really tell from tabletop distances, but I would have preferred more standard rifles. I ordered a sprue of Warlord’s German weapons to address this issue with my next batch. The paint job is pretty simple — block paint, Army Painter strong tone, highlight (much with drybrushing), and camo. I need to work with the skin tones on my next figures because I would like to achieve a better blend of colors. I umpired a match of Battlegroup today for some newcomers to the hobby. I don’t have a lot of experience with Battlegroup, but I’ve enjoyed the system when I’ve played. I appreciate that it delivers a historically plausible game and (usually) a conclusive win-lose decision. However, I have had problems with its handling of command and control, which I think is abstracted to the point of being detrimental. Two solutions came to mind today–I hope readers may weigh in with opinions on whether to implement these rules. First I should identify the problems I see. One is that there is no mechanism that encourages unit cohesion. Teams can freely intermix and operate on opposite ends of the board without penalty. Platoon leaders do not need to be anywhere near their platoons. A second is that leaders contribute very little except an extra order and the ability to spot, so they are best left well back in safe positions. I can understand this for the battlegroup commander, but platoon leaders at least should be up at the front with their troops. Platoon-level officers only grant an extra order if they are within short range (10″) of another unit in their platoon. Only units within an officer’s platoon that can trace an unbroken chain (10″ links) between other platoon units to the officer may use the extra order the officer generates. Platoon leaders may use the “tactical coordination” order on any unit under their command within short range (10″) of the officer. So Battlegroup-playing readers, what do you think? I’m back in action! Our recent move to a new home put a real crimp in my hobby time and motivation. I’ve been in a bit of a gaming doldrum for the past couple months, but I just completed my first post-move unit and I’ve located some outstanding gaming venues. The mojo is starting to flow again. A terrible photo of my recently completed dismounted Confederate cavalry is below. As you can see, I still need to figure out the lighting for photography in my new place. The figures are all fantastic casts from Blue Moon. These guys run a bit big, probably around 18mm, but they are full of character and detail. These boys probably won’t see much action on the tabletop. They’ll be running around getting their names in the papers while the infantry dukes it out. I’m building up forces for Black Powder using the new Glory, Hallelujah supplement. However, I lack the motivation, time, and interest to crank out large units, so I sent away for my first commission project. My plan is to put a basic Confederate and Union brigade each out for commission, then add on odds and ends myself as inspiration strikes. My next personal project is Chain of Command in 28mm. I’m finally giving in to the shiny toys. I have a new gaming buddy here who is aiding and abetting the move–spread the lard! Look for more on that later. Transient living is finally at an end! After a move from Kansas to New York that somehow saw us swinging through the Deep South, we’re now officially unpacked! Bad news? My consolidated man cave is gone. The new house just doesn’t allow it. Good news? I have a “painting nook” and I managed to seize half of our fantastic half-finished basement to turn into a permanent gaming area. I seem to have forgotten to pack my painting mojo, however. I’ve tried to tie in to a few groups here already, but none harmonize perfectly with my interests. Now I need to decide if I start a sustained project to recruit some players to a few of my favorite games (Chain of Command, anyone?) or to some promising possibilities (Saga? )….or if I cast my lot in with the already popular games on the local competitive scene. Feels weird to think about diving in to 40k or Bolt Action…. Stay tuned as I agonize through this mid-life crisis! Also, any advice is welcome! I set up a simple scenario that featured a large band of orcs, led by a ringwraith and his lackies, attacking a small village. The village militia, not wanting their homes burned down, turned out to repulse the raid. Nearby, a small band of rangers led by Aragorn that had been stalking the ringwraith decided this was their time to strike. Each player took a different faction (human militia, rangers, orc) and received different objectives. The orcs scored points for burning down buildings and killing leaders. The militia scored by keeping buildings standing and breaking the enemy force. The rangers scored for killing the ringwraith and orc captains. The forces involved were large for SBG at around a thousand points for the orcs, and combined thousand points for the men. Eschewing subtlety, the orc commander rushed his force forward right down the center in a giant tidal wave of smelly evil. A giant scrum emerged in the center of the table. Unbelievable dice rolling and the decision to front-load the orc captains at point of attack led the town militia to collapse fairly rapidly. On the orcs right, the rangers burst out of a large forest to wipe out a small contingent of warg riders and pose a major threat to the flank. The orcs isolated the militia’s right flank, cut down the militia captains, and surrounded the remaining men. In the center, the militia’s leader rallied a defense and joined in with the rangers to dent the orcs’ right flank. Seeing an opportunity, Aragorn plunged in to the brawl chasing the ringwraith. In a brutal round of combat (three attacks, three hits, three 6’s to wound), Aragorn smashed the enemy general. We had to call the game soon afterward. The forces of men were a model away from breaking while the orcs still had around 15 models to go. However, in a classic wargamer move, the orc player opted to kill everything on the board instead of fulfilling his objectives. As a result, the forces of men decisively won in terms of victory points. Their keys to victory? Kill the ringwraith and die slowly. This was a pleasant way to spend an afternoon. I always have a good time with the SBG rules. If I play the scenario again, I’ll shrink the forces to emphasize heroes, and maybe give each hero a particular task to accomplish. I should probably touch those orcs up at some point too. I bought them as a pre-painted lot off eBay. They look pretty good at gaming distance, except for a few of their bases. Four more models rolled off the assembly line and into the motor pool this week. These halftracks are from Battlefront’s new plastic range. I strongly recommend them! The pieces fit together beautifully with very minimal cleaning up after removal from the sprue. The set came with passenger and crew figures, plus an option for fitting a machinegun on the rear of the vehicles. The box set also contained a great decal sheet, which my halftracks are sporting. I added some stowage from Battlefront (marketed, appropriately, as German halftrack stowage, and available through special order). My only complaint is that the passenger figures are so bulky that sitting them across from one another is a serious challenge. Don’t plan on loading your halftracks up with a full complement of troops. I more or less followed Mig’s Painting Wargame Tanks guide. I can’t recommend the book enough. It is a little lacking in the description department, but it lays out some useful techniques and contains tons of fantastic pictures. I typically don’t weather my AFVs as much as Mig does, but I went a little (too) crazy with the wear and tear on these halftracks. It is hard to stop once you get going! I used the Plastic Soldier Company’s excellent late war German armor spray as a basecoat. I highlighted edges and raised areas with VJ Buff next, then broke out the airbrush for the camouflage. The airbrush is not my favorite tool…I usually spend 5 minutes painting and 30 minutes cleaning and packing. Still, I think I achieved my best result yet with it, so I’m happy. I used Mig’s brown wash for yellow vehicles, painted up some details, applied a light coating of light earth pigments to the tracks and plates, and voila!